During the last few days of October, when Hurricane Sandy was threatening Western New York, state and local officials advised us as to the important documents we should take with us in the event of an evacuation: deeds, home-insurance policies, birth certificates, passports, and the like. In preparation, we should assemble those documents and place them in a waterproof envelope. Sound advice, to be sure. But as I read that official list, I thought of a less than official item I would add to it: the file of documents I have kept for years under my father’s well-worn Bible. Contained in that file are notes, letters, and cards from friends and family, including letters from my deceased mother; birthday cards from my wife; holiday cards from my daughter-in-law; and a variety of notes from my son, some of them dating from his early childhood. Unlike the policies and passports, those documents are irreplaceable. And all were written by hand, which makes them all the more valuable. That value, I might point out, is more than sentimental. It is historical and spiritual. The novelist Philip Hensher, author of The Missing Ink (Macmillan, 2012), has argued, with ample corroboration, that “we are at a moment when handwriting seems to be about to vanish from our lives,”* having been supplanted by the printed—and now the digital—word. If Hensher is right, we would do well to cherish whatever handwritten documents remain extant, irrespective of their author or content. But even if we believe that handwriting, having survived for 5000 years, will always be with us, the act of writing by hand is worthy of renewed attention, if not of veneration. For in the handwritten word, it might be said, the authentic human self is concretely embodied. And the handwritten note or letter, however rough or polished, affords a depth of intimacy between writer and reader that print can only approximate. Little wonder that the world’s great spiritual traditions, Zen included, have accorded the handwritten word—or character—a place of honor, whether the handwritten text be the Torah, the Quran, the Heart Sutra, or the Book of Kells. Yet, if the Zen tradition shares a common regard for the handwritten text, it differs in one important respect. In contrast to such treasures as the Lindisfarne Gospels, which were slowly and meticulously transcribed by medieval monks, some of the most revered texts of the classical Zen tradition are in essence improvisations. Executed spontaneously, without revision, they reflect the state of the practitioner’s mind at the moment of composition. 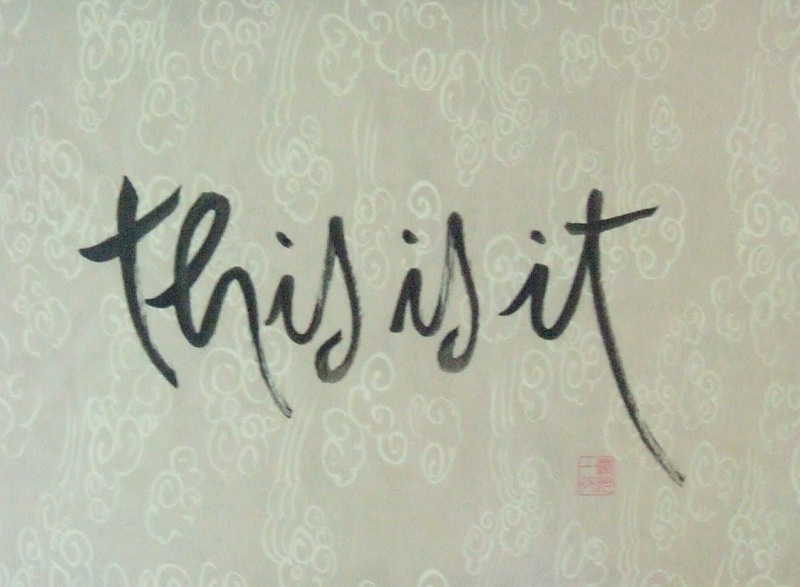 In a frame on our wall, my wife and I have one such text: a rendition of the Zen slogan “This is It,” inscribed in a fluent English script by the Venerable Thich Nhat Hanh. Stamped in red ink with Thich Nhat Hanh’s personal “chop,” this inscription is not a reproduction. On the contrary, it is an original work of calligraphic art, and to contemplate it for any length of time is to feel the presence of a true Zen master, whose clear and spacious mind, at the moment of inscription, is unmistakably reflected in the words he inscribed. By the same token, Thich Nhat Hanh’s inscription also affords access to its author’s unguarded heart. I am reminded of Sylvia Townsend Warner’s comment, apropos of the great letter-writers of the past. Look, they say. These black signs on white paper, they are me. My blood ran with this ink. ** And I am reminded, even more, of my own encounters over the years with the handwritten words of writers living and dead, among them W. B. Yeats, Gerard Manley Hopkins, Loren Eiseley, Adrienne Rich, and Seamus Heaney. In every case the connection thus established transcended the merely literary. As I reflect this morning on those encounters, one in particular stands out. During a visit to Dublin in the 1980s, I stopped in at the National Library of Ireland, where I was given permission to view and indeed to hold the original manuscript of Patrick Kavanagh’s “The Great Hunger” (1942), one of the seminal poems of modern Irish writing. As I examined the manuscript under a green-shaded library lamp, Kavanagh’s poem became more than a literary monument. Scrawled in the pages of a college blue book, it became an avenue to its author, whose vulnerabilities as well as gifts were on full display. “I wasn’t really a writer,” Kavanagh once remarked. “I had seen a strange beautiful light on the hills and that was all.”*** In Kavanagh’s rough-hewn but expressive hand, both the erstwhile Monaghan farmer and the gifted lyric poet were vividly present. To encounter both at such close proximity was as moving as it was illuminating. The manuscript of “The Great Hunger” is safely archived in the National Library, and the poem itself is firmly established in the canon of Irish verse. Yet the blue book I was holding was no more permanent than its dry, acid-bearing pages. And from the vantage point of Zen teachings, neither was the self reflected in Kavanagh’s script. Rather, it was the provisional self of the poet Patrick Kavanagh, compacted of his temperament, his literary and social culture, his historical moment, and other, contingent elements too numerous to mention. In her book Nothing Special the Zen teacher Charlotte Joko Beck likens the self to a whirlpool in a stream, subject to continuous change and eventual dispersal. All the more reason to conserve the handwritten documents in our possession, which provide a trace of that temporary self, whether their authors be Zen masters, celebrated writers, or members of our families. And all the more reason to pick up a pen. * Philip Hensher, “Why Handwriting Matters,” The Guardian, October 6, 2012. ** These lines appear in Sylvia Townsend Warner’s review of Katherine Mansfield’s letters. Warner’s remarks are quoted by Claire Harman in her review of With the Hunted, a selection of Warner’s writings, Times Literary Supplement, October 5, 2012, 4.